Ösp, who alternates between living in London and Iceland, grew up on a farm called Tjörn in Svarfaðardalur, near Dalvík in northern Iceland. The family used to be farmers but all that has changed, and now her father works as a mountain hiking guide, taking groups of people hiking around the area, telling them stories and teaching them about the plants. Ösp’s mother is a singer and performs together with Ösp’s father quite a lot. They use music in the hiking tours, where they perform for the groups on the final night. They are planning on converting the barn and the cow shed into accommodation for visitors, and together with her brother, Ösp also wants to build a recording studio in the barn. Her sister is a textile designer and has ideas on how to weave that into the concept too; together they are turning Tjörn into what Ösp likes to call a ‘Culture Farm’. Ösp’s mother made the wool dress she is wearing and she uses it very much in the cold English winter, even sleeping in it! 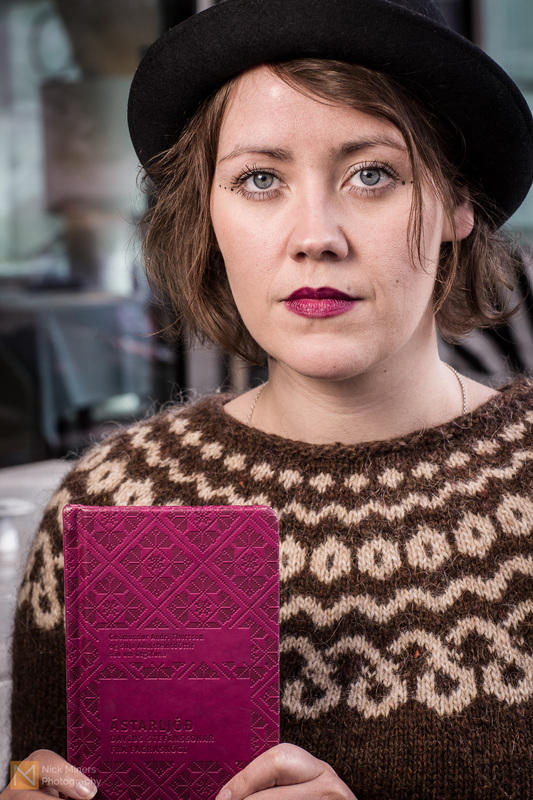 The book is a selection of love poems by Davíð Stefánsson. He is one of Ösp’s favourite poets and was also from north east of Iceland. She likes to read these poems on the busy tube: “People never talk on the tube, avoid eye contact and are all wired up with their phones and iPads. I like reading these romantic old poems, to keep me connected with myself.” She also uses Davíð’s poetry in songwriting.